From the Rusty Hinge distress products to rusted bolts, rust cardstock to aged or tarnished metal - we want to see your take on rust this week. Will you use crackle paints or alcohol inks to rust or add age to your project? Or literally use a rust color something? Perhaps you’ll take a ‘rustic’ approach instead and stretch my meaning. Whatever you’re up to, we can’t wait to see your inspired creations. With Halloween only a few weeks away, Sandra Mouwen has tomb stones and rusty fences on her mind. I really like distressing and aging things, so this weeks challenge is right up my alley! It's almost Halloween and I wanted to make a tomb stone card. I've created this tomb stone with the Dylusions Perfect Splatter Technique. I used Black Marble Dylusions with lots of Pewter Perfect Pearls Powder. The letters are cut out from Silhouette Silver Vinyl. The Fence I altered so I really looks very rusty. 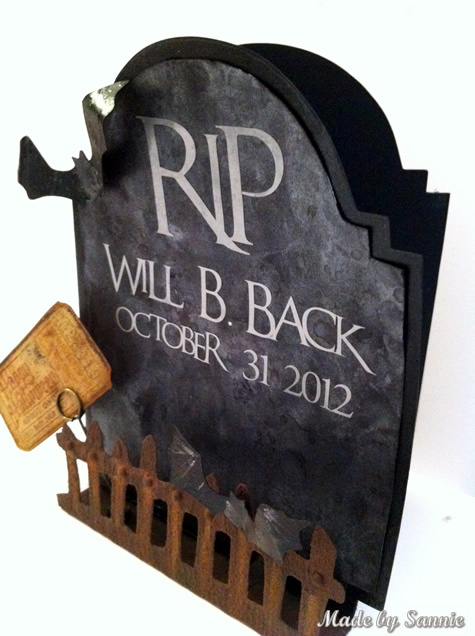 I did this by using Black Soot Distress Embossing powder and lots of paint such as Espresso, Pitch Black and Terra Cotta. You find yourself in a haunted house, rummaging through piles of dusty cobweb covered books when you come across Candy's spooky, eerie, "rusty" Book of Spells! 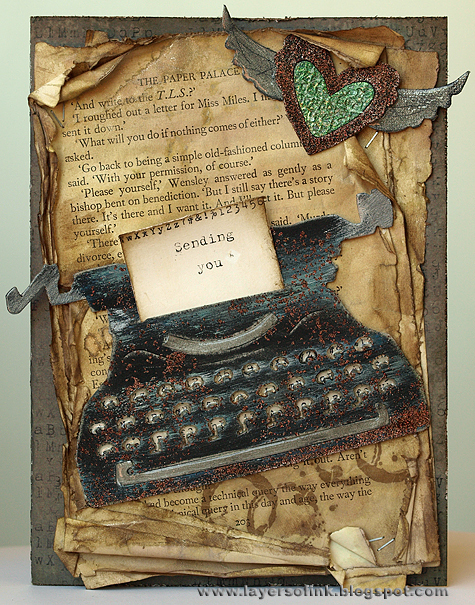 You have GOT to love the versatility of Tim Holtz products for this piece! 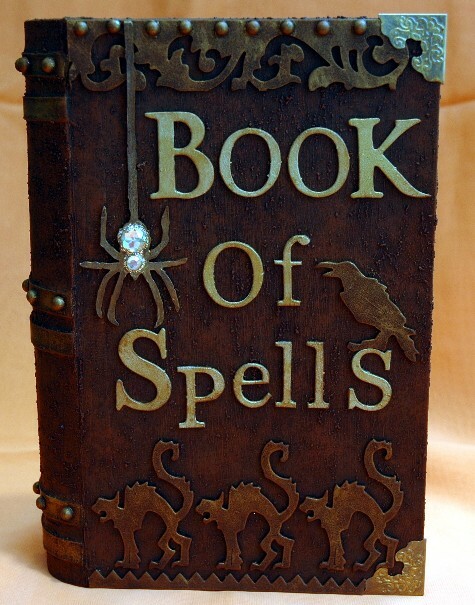 I transformed this plain paper mache piece into a rusty "Book Of Spells" thanks to some acrylic paint techniques, Grungeboard and some really fun die cuts. The spooky raven and cats from Mini Cat & Raven Movers and Shapers, the scary spider from Candelight Fright, the pointy edging at the bottom from Mini Scallop and Pinking, the ornate top piece from Scrollwork all worked perfectly together to create this design. The "Book Of Spells" letters are from Tim's Mixed Minis and Grungeblocks collections. But oh...wait...more spooky surprises await when you open the rusty cover! Rust brings many things to mind, but for Ashli, all she can think of is her home of almost 10 years, which happens to be quite a fixer-upper! We have so many photos from home reno projects tackled in the last 10 years. This particular picture is one of my favorites and was a perfect match for a "rusty" page. After rusting some washers in vinegar, I layered up my photo with Lily Bee, Studio Calico, and October Afternoon patterned papers. Then, some punched papers layered under my rusty washers and stitched on with Doodle Twine make some fun little embellishments. Our home seems to be a constant work in progress and this week's theme was the perfect time to scrap it! When Trace thinks of Rust, she thinks of manly, but because she always loves a challenge....she decided to try and make a "girly" card. In order to make this girly card I knew I had to start with my Hero Arts Lace Background stamp. It is one of my favorites, and oh so girly! To get the rust colour I wanted, I combined two different embossing powders,Tim Holtz Distress in vintage photo and American Crafts Zing in copper metallic. Of course a girly card would not be complete without flowers and lots of them! I knew the perfect dies for this would be Simon Says Stamps Bella Bloom and Delicate Dahlia and My Favorite Things die Mini Rolled Roses. I had just picked up this wooden paint stick and thought it would be fun to rustify the surface. My son and I discussed the best colors to create a rusty effect and we decided to go with black and gold. I used some of the Stampendous Embossing Enamel Aged Gold and Tsukineko StazOn - Jet Black ink to create the colors in my rusty technique. The fun Halloween stamps are from Graphic 45 Happy Haunting #1. Inspiration came in the form of new techniques from an on-line workshop for Tracy this week to create her spooky rust effect shadow frame. 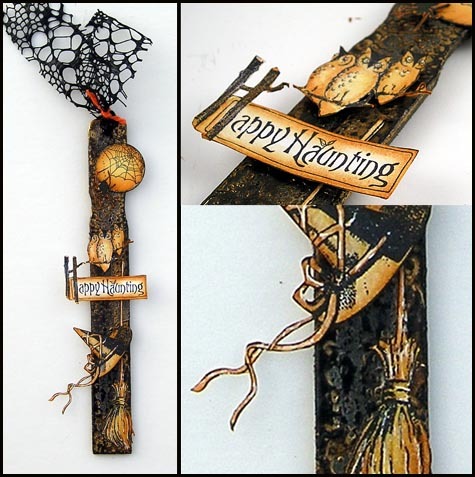 This is one piece that I really enjoyed creating because I love all things rusty, I love Halloween and I love texture and all those are captured in abundance in my spooky piece. 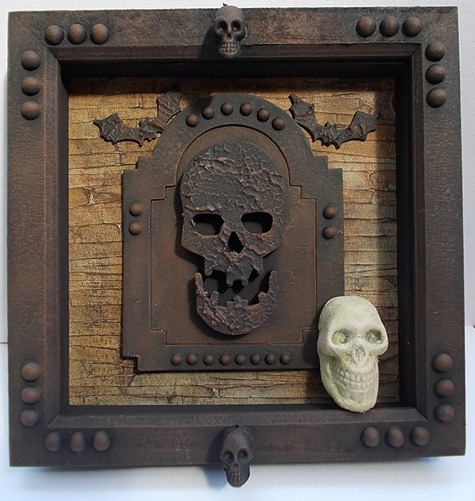 Lots of texture from Gesso and dimension from a framed skull cut six times from mount board using the Sizzix Skull Die. No spooky creation is complete without bats which I have used around the outside edge of my frame adding two to the central panel, all cut using the Bewitching Hour die. This will have a place of pride on my lounge coffee table during our Halloween celebrations. Terry was playing around with a Top Hat and made it a Rusty one! I always wanted to make a Top Hat, and I thought it looked so classy I took the opportunity to decorate one in a vintage style for this week's challenge. When I started my project it was just a black plastic hat, can you believe it? I used lots of layers of Gesso, Walnut Stain Distress Stains and Crackle, and I am pleased with the outcome. The roses are worked on with Walnut distress stain and the Antiqued Bronze Crackle. On the side I played with a sprocket gears and game spinners and since I love butterflies I placed a HUGE butterfly at the back of the hat to finish my project. Sarah was in her element with this week's challenge theme. Creating rusty tones and textures with Alcohol inks and metal are one of her all time favourite things. When I see an old tin at a flea market or find one lurking in my hubby's shed then my fingers are just itching to alter it into something new, but old looking, if you get my drift! This old bicycle repair kit tin was the ideal candidate and makes the perfect keepsake box. 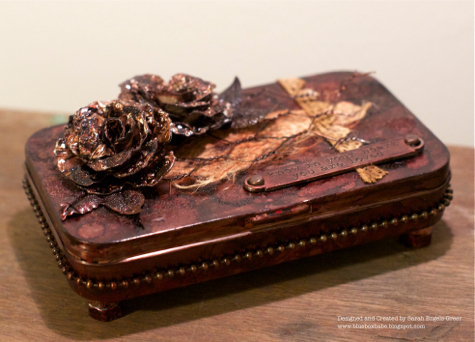 After sanding the box down I used lashings of Alcohol Inks and Distress Powder to create my rusted look. I think aged grunge roses are the perfect companion and so I created two using embossed Metal Foil Sheets before finishing my tin with an Idea-ology Ball Chain wrap and Word Band. 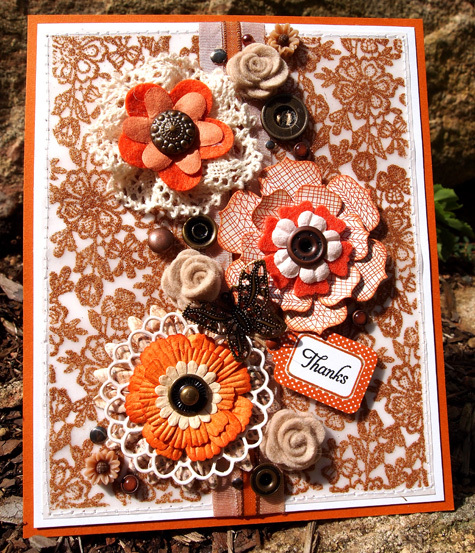 Dan's card was inspired by the rust colours of autumn. 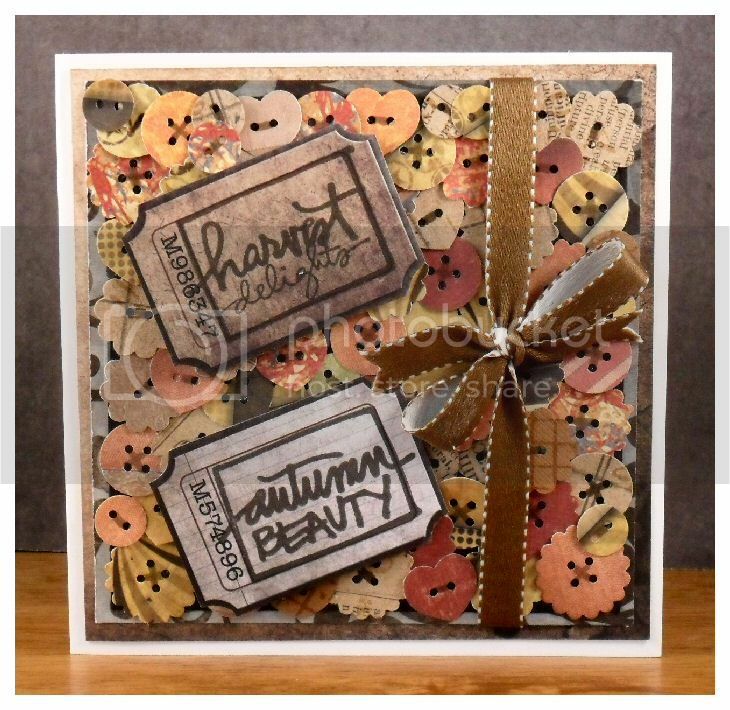 When I was originally planning a project for this theme, I decided to collect some rusty-coloured autumn leaves to use as a feature. Once I'd pressed them and came to use them they smelled awful, so I had to have a rethink. I've still taken autumnal colours as my inspiration but used buttons as the basis for my carpet of leaves. As you can see, it took quite a few to cover my card, luckily the Martha Stewart buttons punch makes 5 at a time! The sentiment stamps are from the Ali Edwards Leaves are Lovely set and the tickets are from the Tattered Time card stack. Buttons were punched from Tattered Time, Kraft Resist, Destinations and Lost and Found card stacks. I (May) have been playing with ways to take cheap decor pieces and turn them into something special using my craft stash. This challenge and a $2 pumpkin were made for each other! I love decorating my home with fall and autumn and leaf themed items - it means that they can be up through November, and I do love decorations that can stay up for more than a few weeks! I used alcohol inks, then acrylic paints, and finally dylusion ink sprays on my pumpkins. For my leaves a combination of distress, rock candy, paint, and dylusions came together to make truly random fall paper leaves. 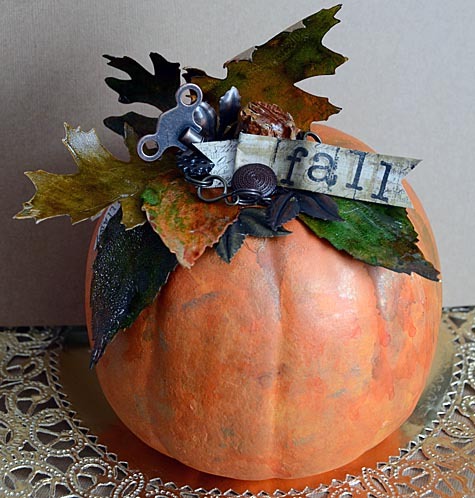 I love my rustic decor - but to take it a step further I grabbed some rusty metal bits and let them accent my pumpkin. Now I've got a customized pumpkin that looks much better than the cheap white thing I came home with! I had a great time with this challenge, and encourage you to check out each of the design team member's blogs for more photos, supply lists, and more. Simply click on their name (above the photo of their project) to visit their blog. Now that we've shared the team creations - we're ready to see yours! As always, Simon Says Stamp is giving away a $50 gift voucher that will go to a random entry chosen by Random Generator. The challenge will close at 11:59pm Eastern time on Sunday, October 14th and the winner will be announced during the following week. To qualify all you need to do is create a new project that ties in (in any way!) with our theme and post it, along with a link back to this challenge, and add a link here. Lovely pieces from the DT and great inspiration!!!! Thank you! stunning DT samples (like always)! thanks for the unusual challenge themes! Stunning piece From The DT,its so different and beautiful. thanks for the nice challenge and the inspiration. this was definitely a fun challenge...to create rust, I love it! Absolutely Gorgeous creations from the DT!! thanks for the inspiration! great DT samples...thanks for the "rusty" challenge...that's a new one for me, lol! I've just had an absolute ball hopping round the fantastic DT work - so much inspirational creativity! Thank you for a fantastic challenge! There's no doubt that 'rust' has taken off as an inspirational art-making process. Lots of great stuff here. These projects are totally inspirational! Thank you for sharing - Have a great week! Fabulous inspiration by the team and a great challenge! I love rust!!! The DT projects are fantabulous!! This has really been one of my favorite challenges!! F.A.B.U.L.O.U.S. projects! I'll see if I can get one done in the few hours left. absolutely fab designs by the DT. Definitely impressed with the Andy Skinner style....might have to do a course. Have absolutely loved this challenge (another entry!)... what sensational inspiration from the challenge itself and from the DT, thank you!